The U.S. Department of Defense (DoD) issued a solicitation Tuesday seeking pre-proposals for multiple projects at military installations that will assess large-scale energy storage within microgrids. Applications are due March 8 by 2 p.m. ET. 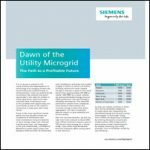 In describing its reason for pursuing microgrid technology, the defense department noted that major power outages are growing in number and severity in the United States. In addition, military bases are experiencing outages more often, and those outages last longer. “There is growing concern whether military bases can maintain critical functions during outages that last for days or weeks, as opposed to hours. 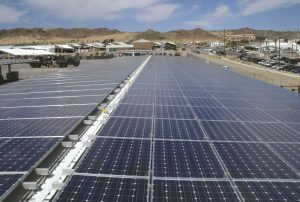 DoD is actively pursuing the deployment of microgrid technologies to provide improved energy security for longer durations,” says the solicitation. The defense department is focusing on innovations that improve energy security. It plans to compare the cost of achieving energy security with or without energy storage within a microgrid. The defense department will assess cost over a 20-year net life-cycle period, with consideration given to installation, maintenance, replacement, electricity bills, and market participation revenues. 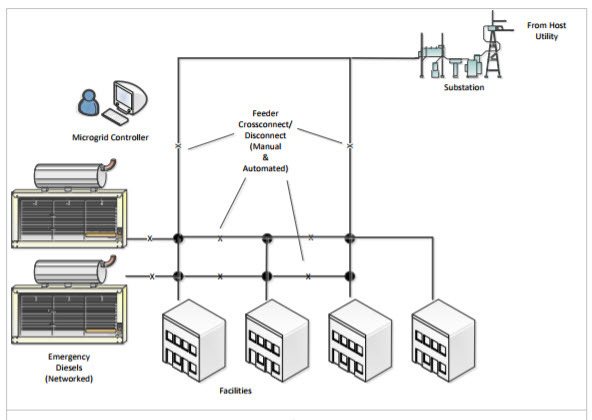 The energy storage microgrid will be compared to a baseline diesel generator (see graphic below) with solar added. The baseline microgrid will rely on a set of 2,000 kW diesel generators. Each generator will have a heat rate of 10,618 BTU/kWh. Projects will be executed in two phases. The first phase will involve design and modeling of the microgrids in various climate zones and energy markets. The military anticipates Phase 1 work beginning next summer and being completed by March 2019. The second phase requires technology demonstration and validation. Defense will select a subset of modeled systems to demonstrate promising technology at a few military installations. A request for Phase II proposals will go out in spring of 2019. Currently, the Environmental Security Technology Certification Program (ESTCP) is seeking pre-proposals for Phase I only. An an online seminar, “ESTCP Funding Opportunities – FY 2019,” will be offered on January 18 from 1:30 – 2:30 p.m. ET. During the online seminar, participants will have the opportunity to ask questions about the funding process, the current ESTCP solicitation, and the proposal submission process. The project contact is Tim Tetreault, ESTCP program manager for energy & water, 571-372-6397; tim.tetreault@nrel.gov. The solicitation materials are available for download through the ESTCP. Interested in military microgrids? Check out these stories on Microgrid Knowledge.